Since 2008, the new car market in South Africa has been experiencing declining sales in passenger cars and light commercial vehicles. New entrants into the market have also eroded market share for the established manufacturers. Research into automotive aftersales at the time revealed that on average, R1.9m of profit was ‘lost’ in the Service Department alone. Quazar began looking at ways to improve sales and profitability in both Used Cars and Aftersales. 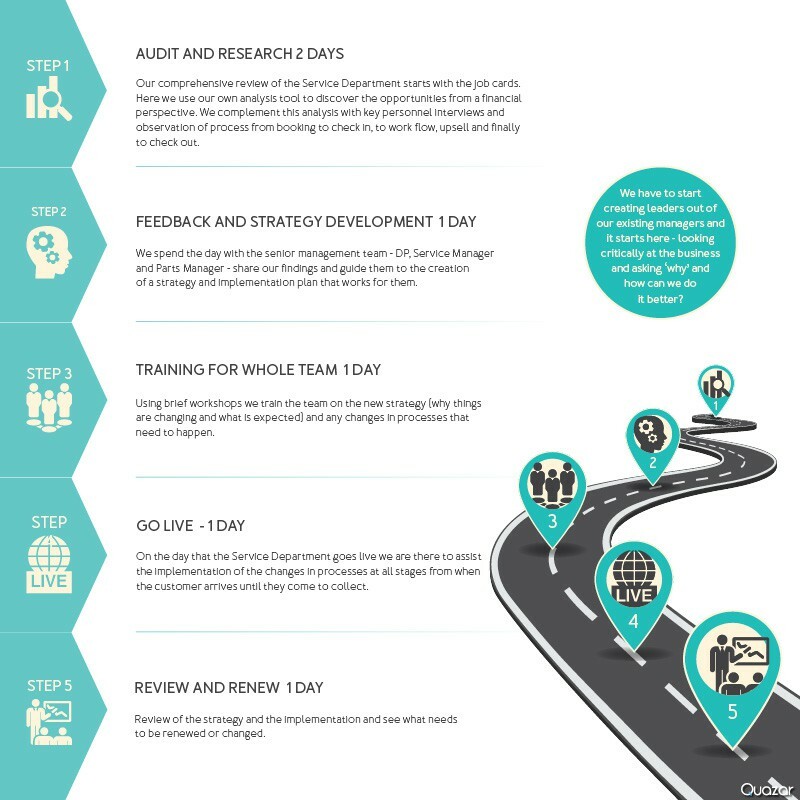 In 2012, we identified a small sample of dealerships from a leading automotive brand, and implemented a 7-month programme designed to provide each dealership with their own strategy and implementation plan, reflecting their unique market, resources and capabilities. A year into the programme, annual results showed a remarkable 53% increase in service nett profitability. Repeat business from happy customers meant that CSI also improved, releasing the incentives from the manufacturer, in this case R2m per annum. Our programme revealed that a new approach was needed – one that was prepared to question existing paradigms and come at the opportunity from a new perspective. Our audit and research process in each dealership allows us insight into ways to maximise the opportunity with existing resources. Our work over the past 7 years has led us to the development of a programme which kickstarts this process for dealers – simple for dealers to implement and repeat. It’s clear that we have to start creating effective leaders out of our existing managers. Change starts here, today. Get in touch with Paul to discuss how Quazar can help your dealership.